A new mobile application called Phantom is offering a way to post personal photos and videos to blogs and social media sites, like Facebook or Twitter, which “self-destruct” like they do in Snapchat, while also offering controls that limit the number of people who can view the content, and more. The idea to allow for ephemeral sharing on Facebook and other sites is interesting, though the number of controls Phantom offers makes it a bit more cumbersome to share that content in the first place. 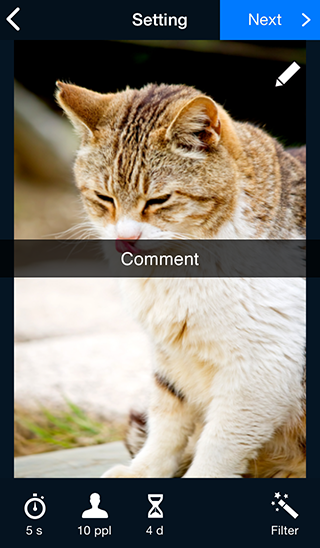 The app, available on both iOS and Android, lets you snap a photo or record a video, or select an item from your smartphone’s gallery, then mark it up with commenting and drawing tools that are very similar to those found in Snapchat. But instead of just offering a timer function to control how long the image or video is visible to a friend after it’s shared, Phantom also lets you configure how long the content will live, period, as well as how many viewers it can have. That way, you can set the content to expire after a certain amount of time, no matter how many people have seen it or not. And by limiting the number of viewers, you have more control over how widely a piece of content spreads. Of course, Snapchat does this too, in its own way – by sending your photo or video just to a selection of contacts, you’re already indicating how many people should see the content you’re sharing. But Phantom big difference is that it’s designed to work with more public networks, including Facebook, Twitter, Google+, WordPress and Blogger. And via a “More” option, you can also share to Tumblr, Pinterest, Whatsapp, LINE, Telegram, Movable Type, iMessage/SMS or email. It’s sort of like a Snapchat that works everywhere else. However, because of the many settings Phantom offers, there’s a learning curve to using the app, and that can slow things down. The uploading process of saving the media to Phantom’s servers is a little slower than I’d prefer to see, too. But the end result delivers. Recipients are given a link along with a mosaic image preview. But to open the image, they have to use the Phantom iOS or Android application. 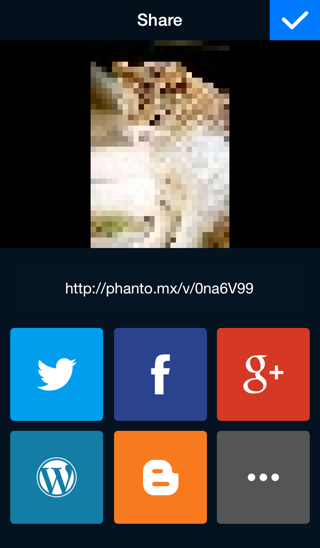 Phantom also takes a harder line against taking screenshots of other users’ images. Those who do will be automatically banned from Phantom, and will be reported to the user whose privacy was violated. The idea for Phantom comes from “LinX Corporation,” a big name for what’s really a one-person, bootstrapped startup out of Tokyo, run by founder Date. The app was actually launched a few months ago, but hasn’t really done much press it seems. My guess is that they’re having a hard time reaching the international audience, thanks to language barriers and other communication differences. The website is in Japanese. And the email I received suggested I contact Date, “Representative Director of LinX Corporation,” which doesn’t exactly sound like a startup. But I decided to reach out anyway, because I was interested in this idea of controlling the exposure of your content before publishing to big-name social media. The app is not as polished as it should be to compete in this space, but some of the more viral social apps, including Snapchat and also Yik Yak, have started out a little rough around the edges. The bigger problem for Phantom is not the app’s functions or look-and-feel, but whether or not it can gain the users it would need to stay afloat as a business. Phantom is a free download here on iTunes and here on Google Play.